Sue and I arrived in Porto on Saturday afternoon totally exhausted, there isn’t every any sleep to be had for me on the plane. Don’t know why, just never happens. We met one member of the tour who had arrived the day prior. 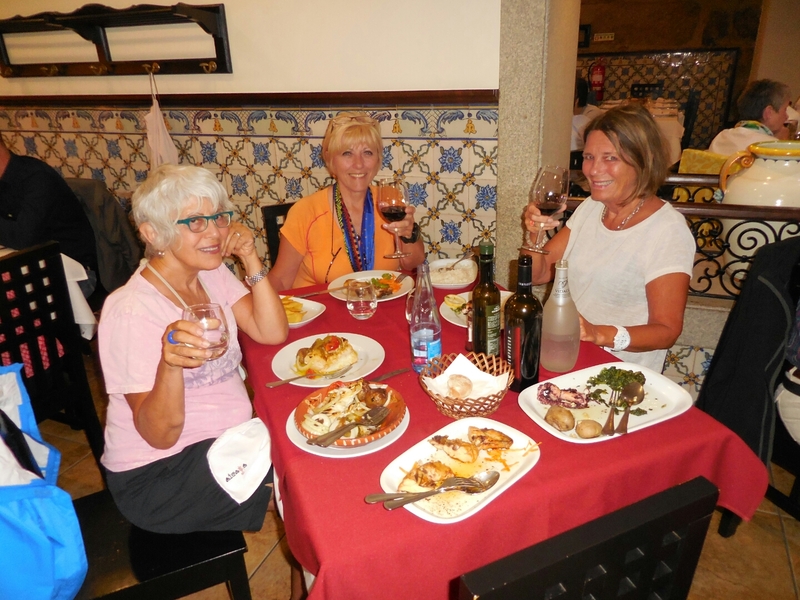 After we settled into the room, the three of us went out to dinner in Restaurant Abadia. This is the restaurant we as the entire group will dine in this evening. The food was wonderful! I am very happy to have chosen this restaurant for our first meal of the tour. On Sunday the remaining members of the tour arrived and were greeted by us at a little cafe across the street from our hotel. We purchased tickets for the city tour bus which were valid for 2 days and included a river boat tour as well as a port tasting at the Cockburn Wine Cave. That evening several of us rode the finicular down to the river and had dinner in one of the outdoor cafes. Little did we know the finicular closed at 10 pm, causing us to have to climb the stairway all the way back to our hotel. You can believe me when I tell you there must have been a million steps to climb after a very hearty dinner and probably too many glasses of wine and then a glass of the delicious elixir, white port! Today most of the group did the sightseeing tour of Porto on the bus and by foot. Since Sue and I had riden the bus around Porto yesterday, we decided to walk to the book store, the cathedral and then to the river. The walk to the river meant a million more steps but in the opposite direction, this time we were going down. The river boat tour was an hour long and absolutely delightful. After the river boat tour, we walked over the bridge and to the Cockburn Wine Cellar. We tasted two different red port wines. Everybody is now readying themselves for this evenings group dinner. It has been a good day. Tomorrow we begin walking our Camino. I am unable to post any pictures, the WiFi in our hotel is simply not powerful enough. I hopefully can post pictures tomorrow. Sounds like a perfect start! So happy to hear that the beginning of your journey started out so well. Have a a great Comino. Hi Arlene, my pilgrim friend. I will be following you with much curiosity. My journey on the CP, will start around July 4/5, after arriving in Lisbon July 2 and spending a day with camino friends and also visiting Sintra. Hey Arlene, what a great way to start what will be a glorious tour., by the way, I know those stairs. If you can climb those stairs after a big dinner, you can walk to Santiago and back in two days! haha. What an adventure! Bill, so far it’s great – although I could have done without those stairs! Arlene, I can picture Porto so clearly and can taste that lovely white port. I look forward to the photos and your posts of your walk. Yay for the first Choose Happiness adventure! I hope you all have magic and serenity every day. Best wishes and buen camino! Burn Camino Arlene. I still look at my Camino photos daily. Happy birthday for the other day too. I hope you really enjoyed yourself. I’m looking forward to reading your journey. Thanks Donna, as long as I have WiFi, I will be posting.